This week the Supreme Court ruled on the Hobby Lobby case. 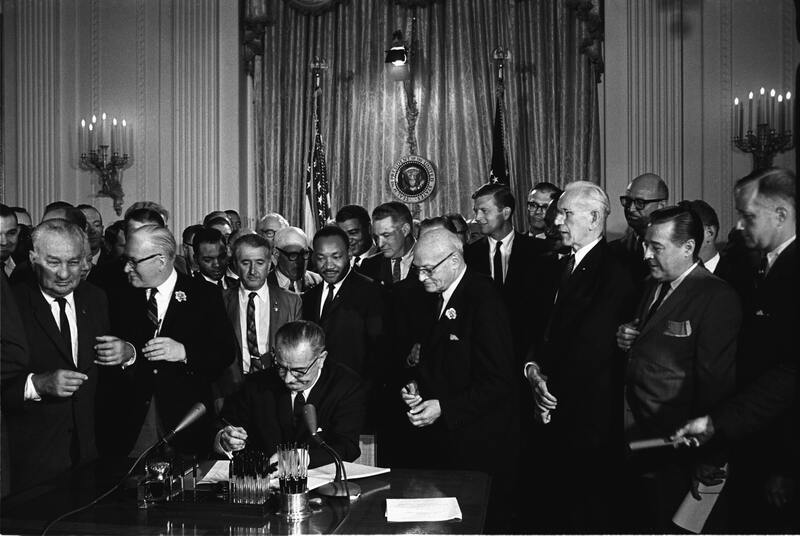 It is “not” ironic that the ruling came the week of the 1964 Civil Rights Act fiftieth anniversary signing. It is a reminder that, WE THE PEOPLE still have a way to go and that the Civil Rights battles of 1964 did not completely address the idea that all “PEOPLE” are created equal. The SCOTUS ruling will directly and indirectly impact the lives of 51% of American women and our nation’s health care law. On a brighter note, this Friday, Americans will celebrate the birth of our nation’s Independence with food, family, friends, apple pie and fireworks. Whilst we celebrate, let us remember the tireless efforts of those who worked and many who even lost their lives so that the Civil Rights Act was signed. In this spirit of remembrance let us remind ourselves to stand by in support of our nation’s women, whose right to choose what they can and cannot do with their bodies is being challenged. The beauty of our nation is our ability to debate issues, but our decisions should never affect someone’s right to choose for themselves. Let us not forget the debates and struggles for a women’s right to vote and segregation were about the right to freely participate in our democracy with the full rights of citizenship. Today’s debate over Immigration Reform, equal pay for women and denying some the right to vote, are a continuation of the debate over freedom and the opportunity to fully participate in American democracy. Over the past three weeks, I watched the World Cup with people of all races and nationalities. Yesterday, the USA lost its match, but it was beautiful to see so many races here in America donning their jerseys, their USA flags and cheering on our national team. That is a sight we would not have seen fifty years ago. As we recognize the signing of the 1964 Civil Rights Act and shake our heads over the Court’s decision, let’s embrace that regardless of a Court decision, we are one nation under God and have the responsibility left by our nation’s founders to protect the rights, liberties and freedom of all PEOPLE. On this Fourth of July, let’s accept and believe our best days still lie ahead. We are one human race made up of many races and ethnicities in a World Cup we call the Earth. We are divided into nation’s and tribes so that we get to know one another and that relationship starts here at home draped by our nationality and our flag. On this Fourth of July, let us reflect on our shared past, and our shared future. When we are both victorious and face setback always remember, “The cause endures, the hope still lives and the dream shall never die.” We will have our challenges like those who came before us and lit America’s torch on July 4, 1776. Sometimes, through the political and cultural conflict, rancor and discord we wonder how we can have a Hobby Lobby decision. If we look to our shared past, we can see it is times like when a tornado wipes out a town in the Midwest, or a hurricane damages the Gulf states that we find our way back to one another to pick up the pieces and put things back together again. If we look around, we will find that our numbers are larger, our mettle stronger than it was two centuries or even fifty years ago. What makes our nation special is our resilience. We come together and stand up for what is right, and refuse to sit, when we know something is wrong. That’s why we celebrate our nation’s Independence and birth every year on the 4th of July. That is why the Hobby Lobby decision came down this week. It is for us to remember that regardless of what the pundits say or the politicians convey, Our nation Under God is indivisible and reserved for everyone to enjoy Life, Liberty and Justice. We are on the right course. Our nation though on a bumpy path at times is fulfilling its destiny of becoming a more perfect Union.